An innovation unlike any other. A technology-based innovation unlike any other, Quantum Interactive™ increases IRT quality by creating a high-quality functioning prototype of the initial study build. The tool provides a user-friendly interface to guide the study building process for faster requirements discovery and is highly configurable, regardless of study design. Higher quality, faster IRT delivery. 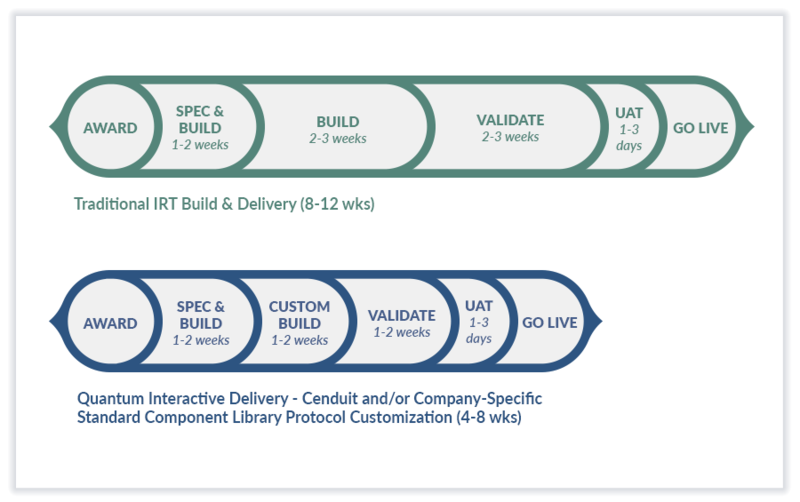 Quantum’s intuitive study design tool reduces the time to Go Live, improves quality, and creates a functioning prototype of an initial study design and live system build using an iterative design process. Save time, gain efficiency & improve quality with Quantum's iterative design process. Using a guided, interactive approach, initial user requirements specification (URS) can be produced ahead of industry standard timeframes. Library of pre-built forms, templates and options. Leverage the flexibility of Quantum to match your business processes. Quantum captures all requirements, whether custom or complex, within the URS, and the initial published live system serves as the foundation for building these requirements. Allows teams to use and provide feedback on the initial study build. Watch Quantum Interactive™ in action.